Dr. Richard Tomko has had numerous administrative responsibilities during his 20-year career in educational administration. He has been a building principal at the middle and secondary levels and responsible for district-wide curriculum, assessment, innovative program initiatives, technology, and professional development as an Assistant Superintendent for Curriculum and Instruction. Dr. Tomko has served in districts in additional administrative positions such as department supervisor, assistant principal, and director of athletics. He began his career in education teaching high school science and middle and high school English in both private and public school systems. Dr. Tomko obtained his principal license and School Administrator certificate after earning his Master’s Degree in Educational Administration (M.A.E. 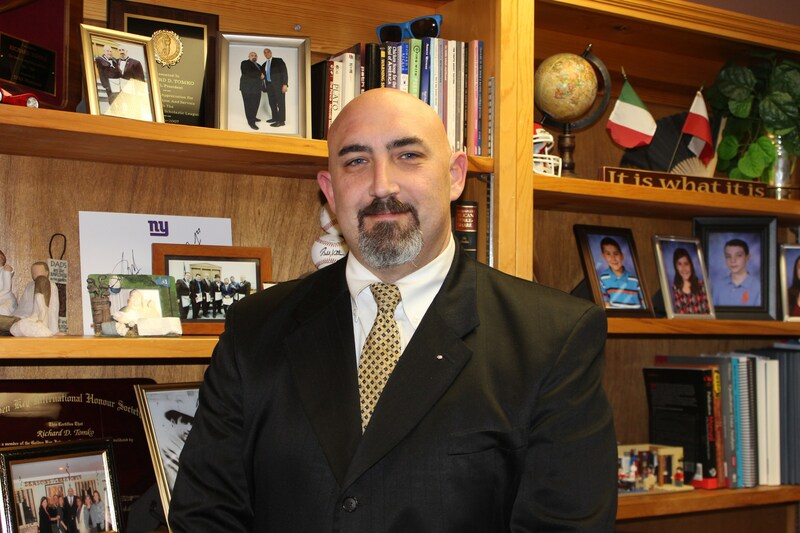 ), and he has attained the degree of Doctor of Philosophy (Ph.D.) with a concentration in Educational Leadership, Management, and Policy from Seton Hall University. Dr. Tomko has also earned a Master of Jurisprudence (M.J.) Degree in Children’s Law and Policy from Loyola University of Chicago School of Law; a Graduate Certificate in The Brain, Teaching, and Learning from The Johns Hopkins University; a Graduate Certificate in Community and Economic Development from The Pennsylvania State University; and a certificate in Leadership for his professional studies at Harvard University. He is currently enrolled in a graduate certificate program in Reading Education at the Kansas University School of Education. Dr. Tomko continues to research the “expectations gap” and lack of articulation between secondary schools and institutions of higher education with the hope of improving student readiness for post-secondary instruction. Past formal research endeavors and publications have included student achievement gaps on statewide assessments; student safety; early childhood literacy; guidance and counseling influence on student application to post-secondary education; bullying; student perceptions of remedial English; and student readiness for college. Dr. Tomko is a 2012 cohort graduate of the National SUPES Academy and recently participated in the Harvard Graduate School of Education Leadership Institute for Superintendents: Systematic Reform in School Districts and Schools. Dr. Tomko is a change agent for creativity and problem solving and works with his administrative teams to decrease achievement gaps between demographic subgroups of learners. He has a proven record of effecting change in districts by involving families, stakeholders, and community groups in the restoration of student engagement leading to overall student success. Since his appointment to Superintendent of Schools in the Belleville Public Schools District in 2015, the Board and administration have successfully authored and implemented an action plan to remediate fiscal concerns ending with a financially sound projection and budget for the upcoming school year that addresses the needs of the students. New textbook series have been adopted; administrative realignment for greater support and oversight installed; and Board policies have been updated to enhance grade point average and district procedures. The current district curriculum team and high school administration continue to enhance academic rigor in district by extending opportunities in the Ralph Vellon Academy of Engineering, Mathematics, and Medical Science, and the district has partnered with Clara Maas Hospital to promote community engagement and volunteerism while reflecting Academy STEM standards that surpass the expectations of the instructional core. Content curriculums have been updated and exit skills infused to challenge students at every grade level. The 2018-2019 school year welcomes the final stage of the district 1:1 Chromebook initiative where all students in grades 2 through 12 will have their own technology devices for school work, assessment, and research purposes. Referendum construction and building enhancements are underway, and district beautification projects to enhance neighborhood schools are in partnership with local businesses and parent organizations. The Board continues to work in monthly committees to lead the district mission and ensure that the vision of the district - where all students can learn - is being supported by all aspects of the school district. Dr. Tomko sits on numerous Boards and Commissions throughout the state, and he was recently honored as a recipient of the New Jersey Governor’s Jefferson Award, 2018. He was also recognized by the United States Department of Defense with its’ Patriot Award, an honor that reflects the efforts he made in support of citizen warriors and the members of their families. Dr. Tomko is married, has four children, and dedicates his spare time volunteering as a coach for local recreation sports teams and other non-profit organizations.